My interview with Matt Hooke for WRUW-FM, the Cleveland NPR station. Originally aired 3 April 2019. New reviews for Piano I.
Greydisc Records announces the worldwide release date for Ethereal III: 23 April 2019. Complete information and audio samples available here. A new interview from Music Web Express. Today I delivered the masters to the label for Ethereal III, my new duo record with Sándor Szabó. This album is very different for us both, and is in an entirely new direction for us. More info and an album sneak-peek coming soon. Piano I is officially released today. New reviews for Piano I. New page for the Electronic Press Kit (EPK). New reviews for Ethereal II. New album sneak peek! Here is a track from my new solo album Piano I, my first all-piano solo album. To be released by Greydisc Records on 12 February 2019. Recording sessions for Ethereal III, the new album from Kevin Kastning and Sandor Szabo are complete. This record is something entirely different for us both. To be released by Greydisc Records in 2019. More info coming soon. Recording sessions are underway for the next album in the Ethereal series by Kevin Kastning and Sandor Szabo. This album will be entirely different than anything we have done. To be released by Greydisc Records in mid-2019. Ethereal II is named as one of the Top 20 Albums for November 2018 by WVKR-FM in New York. Yesterday I delivered the masters to the label for the next solo album, which will be released by Greydisc Records in early 2019. This record is radically different from any other that I have recorded. More info coming soon! Spotify players now available on the Discography and Listen pages. Today in Spain, the Universos Paralelos radio show celebrates their 23rd year on the air by devoting an entire show to my music. Kismaros is named one of the Top Albums of 2018 by MFTOSOTR webzine. Greydisc Records announces 30/36, the new solo album: release date 11 December 2018 on Greydisc Records. New reviews for The Line to Three, 17/66, and Ethereal II. A new interview with Music Web Express. I am pleased to announce that Ethereal I, 17/66, Kismaros, and Even this late it happens are all in first-round voting for the 2019 Grammy® Awards. Click here to read the press release from Bongo Boy Records and Greydisc Records. Kismaros is named as one of the Top 20 albums on the Secret Music program for August/September 2018 by WVKR-FM radio in New York. New reviews for Ethereal I. Today I submitted the masters to the label for my next solo album. The title is 30/36, and features nine new compositions for 30-string Contra-Alto guitar and 36-string Double Contraguitar. To be released by Greydisc Records in late 2018. More info coming soon. A new feature article in All About Jazz magazine discussing my music, instruments, and five recent album releases. Included is a review for Ethereal II, release date 9 October 2018 on Greydisc Records. Sneak peek album preview! The track Arrival (Second Recall) from Ethereal II. This is the opening track on the album, and is a longer composition with multiple sections. Featuring Kevin Kastning: 30-string Contra-Alto guitar, / Sándor Szabó: Electric guitar / Balázs Major: Drums and percussion. Release date 9 October 2018 on Greydisc Records. If you missed the WNYC/WFMU broadcast of the August 15 live performance of Kevin Kastning and Mark Wingfield, you can listen to the archived show here. New photo gallery pages added. Kevin Kastning and Mark Wingfield will be performing on the Irene Trudel show on New York City radio WFMU on Wednesday August 15, 2018 at 7:00 PM US Eastern time. Listen online at WFMU-FM. New interview with Kevin Kastning and Balázs Major. Today I delivered the masters to the label for the new album by Kevin Kastning (36-string Double Contraguitar, 30-string Contra-Alto guitar, Piano), Sándor Szabó (Electric guitar, Electric baritone guitar), and Balázs Major (Drums, percussion). The album is titled Ethereal II, and will be released by Greydisc in September 2018. More info coming soon! New reviews for The Line to Three. Updates for the Quotes page and new reviews for Kismaros. 17/66 is named as one of the top 20 albums for May/June 2018 by WVKR radio in New York. Greydisc Records announces the release date for Kismaros: 24 July 2018. Updates for the Videos page. New reviews for A Connection of Secrets. A nice mention of 17/66 in the Berklee Alumnotes magazine. The 2002 KastningSiegfried album Book of Days will be released by Greydisc Records as a digital download album on 26 June 2018. More info here. Today I delivered the masters to Greydisc Records for the next album. This one is special, in that it's an entirely new duo project: Kevin Kastning (30-string Contra-Alto guitar), and Balázs Major (Percussion). The album is titled Kismaros, and was recorded on-location in Hungary. More info coming soon! The 2018 European Tour is complete. Many thanks to the European audiences for our string of sold-out concerts. Photos from some of the concerts are here. A new interview with Music Web Express webzine. An essay about harmonic blocks, which figure into the compositions on 17/66. The track 15.5mH from 17/66 is being featured this week on WMUH-FM in Pennsylvania. Official release day for 17/66. Available at amazon.com, iTunes, CDBaby, and more. New album reviews for Invocation and Even this late it happens. 17/66, the new solo album by Kevin Kastning. New compositions for 36, 30, and 17-string guitars. Worldwide release date 24 April 2018. New album reviews for Ethereal I.
Greydisc Records announces 17/66, the new solo album by Kevin Kastning. New compositions for 36, 30, and 17-string guitars. Worldwide release date 24 April 2018. More information coming soon! New interview with Kevin Kastning and Sándor Szabó from MWE3 magazine. Recording sessions for the new solo album are complete. More details coming soon. I will be on tour in Europe; May 2018. Concert date information and tour itinerary here. Announcing the Emerald Guitars Kevin Kastning Signature model 17-string Hybrid Extended Classical guitar. Even this late it happens is named as one of the top albums of 2017 by All About Jazz magazine. You can read their album review here. Greydisc Records announces the new album from Kevin Kastning and Sándor Szabó. Ethereal I; release date 2 January 2018. A new interview with Kevin Kastning and Carl Clements by Music Web Express. My interview on WRUW NPR Cleveland; October 20 2017. This week, Otherworld was featured on One World Radio in Cyprus and the UK. You can listen to a recording of the show here. New reviews for Even this late it happens. It's release day! Even this late it happens, the new album from Kevin Kastning & Carl Clements, is officially released today. Available at Amazon, iTunes, CDBaby, and all CD sales and digital download sites. I will be host Matt Hooke’s guest on the “A Different Drum” show on Cleveland radio WRUW-FM 91.1 this Friday October 20; 1 - 3 PM EST. You can listen online at https://wruw.org/. Even this late it happens, the new album from Kevin Kastning and Carl Clements. Released by Greydisc Records on 24 October 2017. I will be on tour in Europe in May 2018. This tour includes solo performances, and concerts with Sándor Szabó and Balázs Major. More details coming soon. Greydisc Records announces the new album from Kevin Kastning and Carl Clements. Release date in October 2017; more info coming soon. Invocation is named one of the Top 20 Albums for August 2017 by WVKR radio in New York. The Line to Three, the new album from Kevin Kastning and Mark Wingfield, is no. 9 on the July 2017 Top 20 album list for radio station WVKR-FM in New York. Many thanks to all at WVKR and especially "Secret Music" show host Scott Raymond. Invocation, the new album from Kevin Kastning and Sándor Szabó. Release date 7.18.17 on Greydisc Records. A Connection of Secrets is named one of the Top 20 Albums of 2017 by the Music from the Other Side webzine. New album sneak preview! "Akathist," from the Greydisc album "Invocation." Release date: 18 July 2017. Kevin Kastning: 36-string Double Contraguitar, Sándor Szabó: 16-string Classical guitar. Today, the masters were delivered to the label for the new album from Kevin Kastning and Sándor Szabó. Entitled Invocation, this will be our seventh album. To be released by Greydisc Records in early July 2017. More info coming soon! A Connection of Secrets, as featured on the Reconnections show on One World Radio; Cyprus Lebanon; 31 May 2017. Greydisc Records announces the new album from Kevin Kastning and Mark Wingfield: The Line to Three. Worldwide release 30 May 2017. The complete Progression Magazine interview; Winter 2017. A Connection of Secrets, the new solo album, is released today on Greydisc Records. Available at Amazon.com, iTunes, CDBaby, and others. New album sneak preview: No Light; But Rather from my new solo album A Connection of Secrets. 10 new compositions for 36-string Double Contraguitar, 30-string Contra-Alto guitar, 15-string Extended Classical guitar, and Piano. Released by Greydisc Records, 28 March 2017. I have delivered the masters to the label for my next solo album. The new record features ten new solo compositions for 36-string Double Contraguitar, 30-string Contra-Alto guitar, 15-string Extended Classical guitar, and Piano. To be released by greydisc Records in March 2017. More details coming soon. UK electric guitarist Mark Wingfield and I have completed recording sessions for our next album. To be released by greydisc Records in 2017, this album is pretty different for us. Stay tuned. Recording sessions for my next solo album are complete. I am back in the recording studio with Carl Clements, at work on our next album. A Far Reflection and Perspectives are named as two of the Best Albums of 2016 by Veritas Vampirus webzine. Perspectives, the new album by Kevin Kastning and Sándor Szabó, is no. 4 on WVKR radio in New York "Secret Music" show Top 20 playlist for November 2016. New album reviews for A Far Reflection. New album reviews for Perspectives. I am mentioned on the November 5, 2016 episode of the New Ears Prog Show, right around the 40:00 mark. New album reviews for Skyfields. Instrumentarium page added for Perspectives. New album reviews for Eleven Rooms and A Far Reflection. Perspectives, the new album from Kevin Kastning and Sándor Szabó, is named as one of the Top 10 Albums for August 2016 by the Afterglow and ThoughtRadio shows on NPR station WMUH in Pennsylvania. New page at the Free Music Archive of my live radio performances which have been broadcast on New York City radio WFMU. Greydisc Records announces Perspectives, the new album from Kevin Kastning and Sándor Szabó. Release date 30 August 2016. A preview clip and sneak peak of the album cover is available here. New album reviews for Eleven Rooms. New reviews for A Far Reflection and Skyfields. New reviews for A Far Reflection. A new interview with Music Web Express magazine. New reviews for Eleven Rooms. Radio Q37 in Greece did a special show devoted entirely to my music on 28 April 2016. Many thanks to Radio Q37. Tonight at 9 PM US EST: Hidden inspiration in music, with a live set by Mark Wingfield (electric guitar) and Kevin Kastning (36-string Double Contraguitar). Recorded live at WFMU, New York City; December 14, 2015. Listen in live at: http://wfmu.org/playlists/shows/65876. Several tracks from my recent albums are being featured this week on the Beyond the Fringe show on radio KCBX-FM in California. Skyfields is being featured on radio stations WMBR in Massachusetts and WMUH in Pennsylvania. I will be the guest on the Ken Field show on WMBR: listen on-line Tuesday February 23 at 3 PM US EST. Skyfields, the new solo album by Kevin Kastning. Release date 2.23.16 from Greydisc Records. New reviews for A Far Reflection and Eleven Rooms. Otherworld and Eleven Rooms are named as Best Albums of 2015 in The Perfect Sound Forever 2015 Critics Poll. Greydisc Records announces Skyfields, the new solo album by Kevin Kastning. International release date 2.23.2016. More info coming soon. A new interview with Kevin Kastning and Mark Wingfield from Music Web Express webzine. A Far Reflection, the new album from Kevin Kastning and Carl Clements, is no. 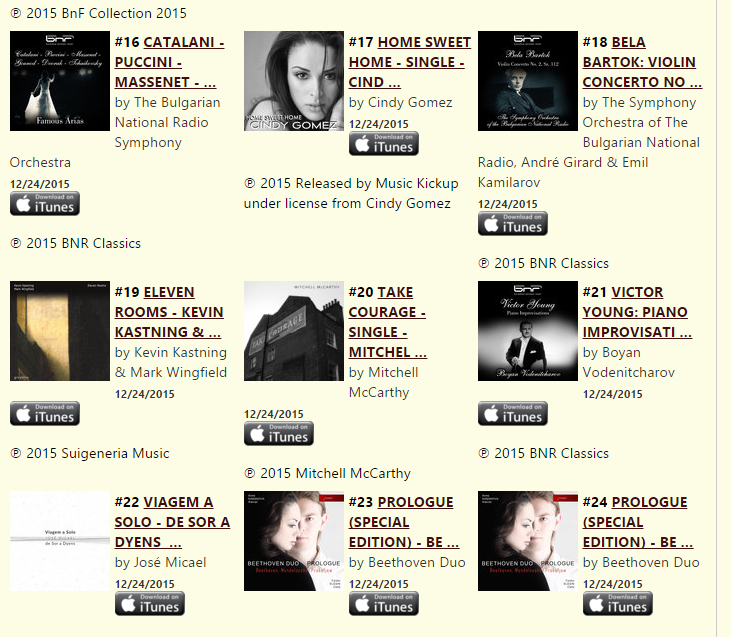 4 this week on the iTunes Top 100 Classical chart. New reviews for Otherworld, Eleven Rooms, and A Far Reflection. Greydisc Records announces A Far Reflection, the new album from Kevin Kastning and Carl Clements. Release date 1.26.2016. A new interview from Canada's Textura magazine. Announcing the new Articles page. Eleven Rooms is named a Top 10 Album for December 2015 by WMUH-FM in Pennsylvania. Eleven Rooms is no. 10 on the iTop 100 Classical chart. Eleven Rooms is no. 19 on the iTunes Top 100 Classical chart. Release day for Eleven Rooms, the new album from Kevin Kastning and Mark Wingfield. Kevin Kastning + Mark Wingfield: We recorded a performance for WFMU-FM in New York City for an upcoming episode of the Irene Trudel show. Irene also recorded an interview with us while we were at WFMU; this episode will be broadcast in February 2016. More info coming soon. Sunday December 13: Kevin Kastning + Mark Wingfield: Live at Shapeshifter Labs in New York City. Interviews page updated with the interview on WHFR Detroit December 4 2015, and the live radio performance with Sandor Szabo on WFMU New York City October 27, 2015. 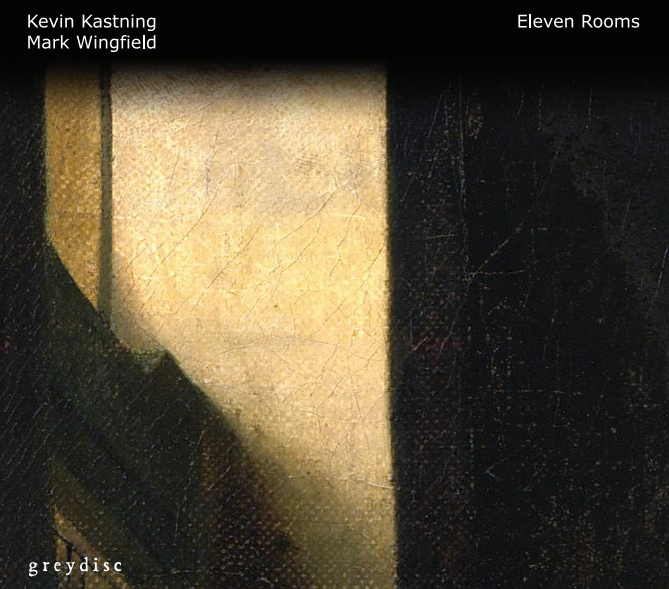 Greydisc Records announces the release of Eleven Rooms, the new album from Kevin Kastning and Mark Wingfield. International release date: 12.22.2015. More information coming soon! Kevin Kastning and Sandor Szabo on the Irene Trudel Show on WFMU-FM in New York City on Tuesday October 27 2015. Listen to the recorded show here. A new interview from Music Web Express webzine. Kevin Kastning and Sandor Szabo: Live performance on the Irene Trudel show on at 8:30 PM US ET. Listen online at http://www.wfmu.org. Kevin Kastning and Sandor Szabo: in concert, Sunday October 25 2015 at Sibley Hall, Groton Library. Otherworld is No. 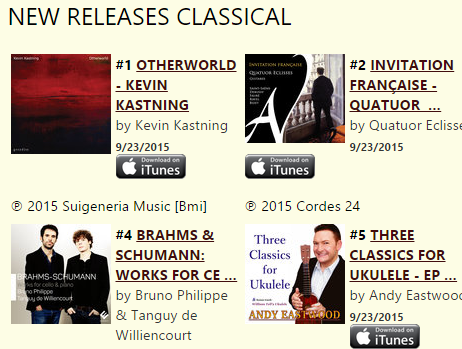 1 on the iTunes classical New Releases chart, one day after its release. Otherworld is being featured this week on WFMU-FM radio in New York City. I will be the guest on an upcoming edition of the Guitar Radio Show (Austin, Texas). The segment is recorded and updates and broadcast schedules will be posted here. Listen in at www.guitarradioshow.com. Otherworld is being featured this week on KBOO-FM in Portland, Oregon. The track Present Red and Vanishing from my forthcoming album Otherworld is being featured this week on WHUS-FM radio in Connecticut. Otherworld is being featured this week on Vermont Public Radio. The track Arc Rotation Shadow from the new album Otherworld is being featured this week on WMUH-FM radio's Afterglow show in Pennsylvania. Videos now available for Dawn Forest Bridge, Aspect Form Vortex, and No Abstraction of Perhaps. All from the album Otherworld. The track Present Red and Vanishing from my forthcoming album Otherworld is being featured this week on WMBR-FM radio in Cambridge, MA. The track No Abstraction of Perhaps from my forthcoming album Otherworld is being featured this week on Vermont's WRUV-FM radio. Otherworld is named as one of the Top 10 Albums of August 2015 by WMUH-FM. Otherworld, my first solo album, is released September 22, 2015 on Greydisc Records. A nice mention on the United Mutations webzine (Belgium). Announcing the Emerald Guitars Kevin Kastning Signature model 15-string Extended Classical guitar. A new interview from The Lodge webzine. New reviews for Watercolor Sky. New reviews for In Stories. An interview with Mark Wingfield, where he discusses our music. New reviews for In Stories and Watercolor Sky. A new page at Emerald Guitars Ireland for the 36-string KK Signature Double Contraguitar. Watercolor Sky is named the No. 1 Best Album of 2014 by Acoustic Music magazine. In Stories is named the No. 7 Best Album of 2014 by Acoustic Music magazine. 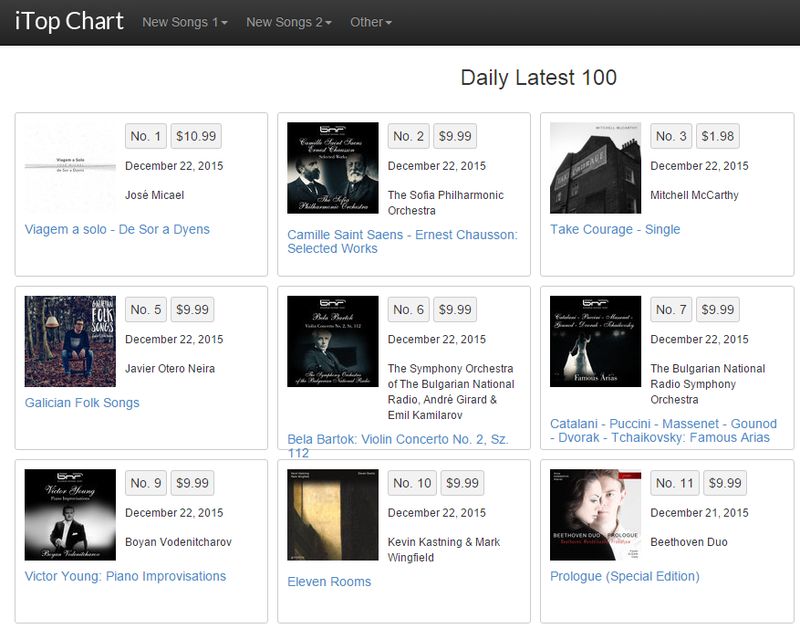 In Stories is number 29 on the US Top 100 new classical releases chart. In Stories, the new album from Kevin Kastning and Mark Wingfield. Worldwide release by Greydisc Records on November 18, 2014. NPR station WMUH-FM in Pennsylvania has named Watercolor Sky as their number 4 album for October 2014. New interview from MWE3 magazine. I have been added to the KDNK radio network Hall of Fame. Watercolor Sky is currently being featured on NPR stations WRUV Vermont, WMBR Cambridge MA, and WMUH, Pennsylvania. I have been named Artist of the Month for August 2014 by K&K Systems. My sincere gratitude to all at K&K. Watercolor Sky, the new album from Kevin Kastning and Carl Clements: release date 7.29.14. This Daytime Haunted, the new video by Kevin Kastning and Carl Clements, from the forthcoming Greydisc album Watercolor Sky. New Tour and Concert Photos page. The May 30 2014 interview with WHFR-FM for Public Radio International is available here. Article in The Groton Line. "I will be interviewing this Incredible artist, Guitarist Kevin Kastning, Friday May 30th on the "Space is the Place" program ( 6p.m. to 8p.m. EST) at whfr.fm Henry Ford College Radio, (Detroit) MI. Public Radio International. Please Join me for this Exciting interview of One of America's Most Critically Acclaimed Acoustic Guitarists Today!" New reviews for Dark Sonatas. New reviews for Nowhere, Now Here. My music is being featured in May on Detroit NPR station WHFR-FM. Listen online; tune in 6 - 8 PM EST. My gratitude to WHFR and the Space is the Place show. New reviews for An Illustrated Silence. My music will be featured this Friday April 18 on Detroit NPR station WHFR-FM. Listen online; tune in 6 - 8 PM EST. My gratitude to WHFR and the Space is the Place show. Announcing the Emerald Guitars KK36 Double Contraguitar. A nice ad from one of my sponsors, Peterson Tuners. Kevin Kastning & Carl Clements: Live in concert: 8:00 PM Friday April 4 2014 in Amherst, Massachusetts at Hampshire College Concert Hall. Tickets on sale now. Becoming and Dark Sonatas are both named as two of the Best Albums of 2013 by Acoustic Music. Dark Sonatas is named as one of the Top 10 Albums of 2013 by MoonJune Records. New album reviews for Nowhere, Now Here. Nowhere, Now Here and Dark Sonatas continue to receive airplay on various NPR stations in the US, including WRUV in Vermont, and WRSU in New Jersey. A new interview with Kevin Kastning & Mark Wingfield from Music Web Express magazine. I am now an Artist Endorser for Peterson Tuners. New reviews for the album Nowhere, Now Here. In the Fall 2013 issue of Berklee Today, the Berklee College of Music alumni magazine, there is a photo of me with the Emerald 30-string Kevin Kastning Signature model and a paragraph about the two most recent album releases. New interview with Guitar Moderne magazine. Dark Sonatas, the new album from Kevin Kastning & Mark Wingfield, is released today. Greydisc Records announces Dark Sonatas, the new album from Kevin Kastning & Mark Wingfield. Worldwide release date 8.20.13; now available for pre-order on Amazon. A new interview with Kevin Kastning and Carl Clements from MWE3 magazine. A new review for An Illustrated Silence from the London Jazz Times. The new album from Kevin Kastning and Carl Clements: Nowhere, Now Here. Worldwide release by Greydisc Records July 16, 2013. Now available for pre-order on amazon.com. This album is the recording debut of the new Emerald 30-string Kevin Kastning Signature Contra-Soprano guitar. New "Album of the Year" review for In Winter. 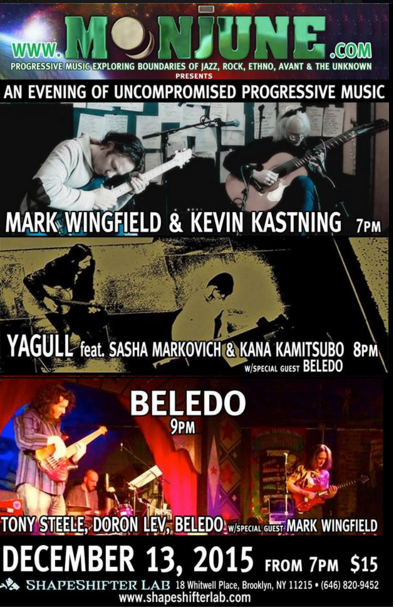 Kevin Kastning + Mark Wingfield: Live in New York City, August 17. This is an album release concert for our forthcoming album on Greydisc Records. Tickets on sale now at Ticketfly. I will be performing this concert using the new Emerald 30-string Kevin Kastning Signature Model Contra-Soprano guitar. New concert review from the 2012 European Tour added to the Concerts Review page. Announcing the Kevin Kastning YouTube channel. New review for Becoming from Guitar Player Magazine. New York City: Kevin Kastning & Mark Wingfield live in concert at Drom in New York City on Saturday August 17, 2013. A big and sincere thank you to these stations! Announcing the Emerald Guitars KK 30-string Triocha Contra-Soprano guitar. First US airplay for Becoming: WMUH in Pennsylvania is featuring the track The Wind Unheard, and WMBR in Cambridge, Massachusetts is featuring the track No Sound of Water. I walked into the silver darkness, my 2011 album with Mark Wingfield, has a featured track on MoonJune Records' compilation album The Open Road, Volume 1. I am honored to appear on this compilation album with such luminaries as Alan Holdsworth and Jan Akkerman. Greydisc Records announces the release date of March 26, 2013 for Becoming, the new album by Kevin Kastning, Sándor Szabó, and Bálazs Majór. Becoming is now available for pre-release purchase at amazon.com. More info coming soon. The Artist Endorsement page has been updated. An Illustrated Silence is named as one of the Top 10 albums for 2012 by NPR affiliate WFMU-FM radio in New York City. My recent album The Book of Crossings with Sándor Szabó makes AcousticMusic.com and FAME Magazine's list of Top 20 Albums for 2012. January 2013 is Kevin Kastning Month on radio station CJAM 99.1 FM in Windsor Ontario, Canada and Detroit. Throughout the month of January, CJAM 99.1 FM will be featuring music from my recent albums Triptych, Dreaming As I Knew, In Winter, The Book of Crossings, and An Illustrated Silence. Listen in to the "Orbis Terrarvm" show, Sunday nights 8 - 10 PM ET. Listen to archived shows here. Carl Clements and I performed at Drom in New York City on 1.4.13. Photos of the concert here. My new album with Mark Wingfield, An Illustrated Silence, is named as one of the Top 10 albums for December 2012 by NPR affiliate WMUH-FM radio in Pennsylvania. My recent album The Book of Crossings with Sándor Szabó makes Acoustic Guitar Magazine's list of Top 10 Albums for 2012. Thank you, AG! See the Top 10 article in the February 2013 print issue of Acoustic Guitar Magazine. 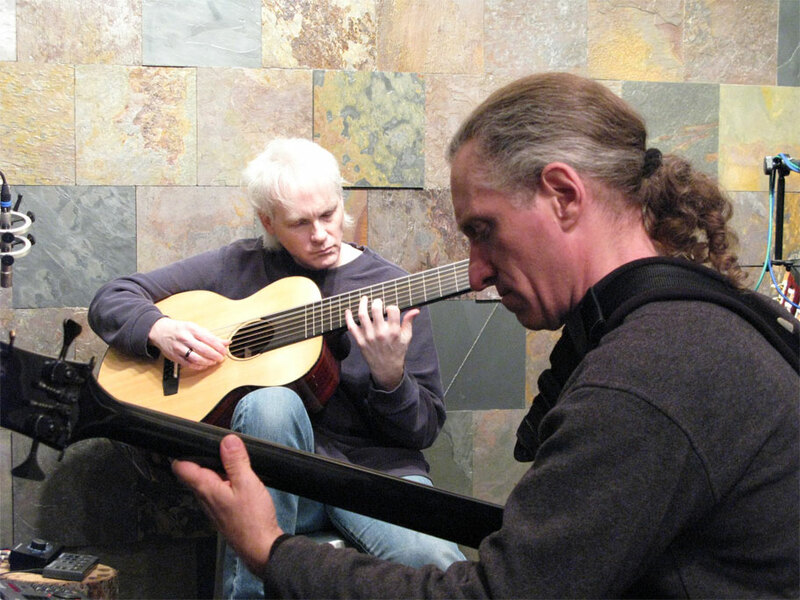 "Acoustic-guitar maverick Kevin Kastning, a specialist in an extra-stringed instrument he calls a Contraguitar, comes to Drom with saxophonist and bansuri flutist Carl Clements, with whom he recorded Dreaming As I Knew, a lovely, contemplative recent album sure to appeal to admirers of early Windham Hill and ECM." New reviews for I walked into the silver darkness and In Winter. Interviews page updated with new interview from Music Web Express magazine. Updated reviews page for An Illustrated Silence. Updated reviews page for In Winter with a new review from Guitarbench Magazine. LIVE IN NEW YORK: Kevin Kastning & Carl Clements: Friday January 4 2013 at Drom in New York City. Tickets on sale now! Announcing the Roberts Kevin Kastning 17-string Contraguitar. Details coming soon! Kevin Kastning and Mark Wingfield: Live on the air in New York City on WFMU-FM on Monday November 5 from 1 - 3 PM. Listen in on WFMU's live streaming links. Kevin Kastning & Mark Wingfield: Live in New York City, November 5 at Drom. This is the album release concert for An Illustrated Silence. Advance tickets on sale now. New reviews for The Book of Crossings and In Winter. An Illustrated Silence is released today. Available at amazon.com, CDBaby, and iTunes. In Winter in Berklee Today magazine. The wonderful photography on An Illustrated Silence is by Anne McGrath. KDNK-FM radio in Colorado has added me to their Hall of Fame. Thank you, KDNK! In Winter is reviewed by JazzTimes magazine in the September 2012 issue. In Winter is being featured on radio KUSF-FM in San Francisco. From Daniel Roberts Stringworks' website: "Kevin is getting more press and much deserved recognition every day as one of the leading avant garde modern classical/jazz musicians in the world. Kevin is incredibly prolific, recording huge amounts of music with many of the most recognized musicians in the genre! I am so honored (and challenged) to be co-designing, building and then modifying to add even more courses to the instruments that he relies upon as he continues his stellar rise to greatness. Currently I am preparing to convert the other Roberts steel-string Contraguitar to 16 strings, and then am building a 16 string classical guitar for one of Kevin's primary collaborators, Sandor Szabo, from Hungary, as well as an 18 string classical for Kevin. Dominic Miller, lead guitarist for sting and noted classical guitarist has called Kevin the most modern guitarist in the world. Check him out if you are interested in this amazing music!" New review for In Winter from Guitar Player magazine. New review for Dreaming As I Knew from Creations magazine. Greydisc Records announces the release of the new album by British electric guitarist Mark Wingfield and Kevin Kastning, entitled An Illustrated Silence. This is the duo's second Greydisc album. US and international release date for An Illustrated Silence is October 9, 2012. The Book of Crossings is on WMUH-FM's Top 10 List for August 2012, and on KFJC-FM Los Angeles' most-played list of albums for August 2012. My December 2010 interview in Guitar Player magazine was just named as one of the All-Time Top 40 Guitar Player interviews. Announcing the Roberts - Kevin Kastning 16-string Contraguitar. New reviews for Dreaming As I Knew. In Winter is at No. 14 on Amazon.com's list of Top 100 Avant-Garde albums. New reviews for The Book of Crossings. The Book of Crossings is being featured on NPR stations WRUV-FM and WMUH-FM. Dreaming As I Knew is in WMUH-FM's Top 10 for July 2012. New reviews for In Winter. "Kevin's music, both solo and in tandem with other talented musicians, creates a bedrock of "aural familiarity" using the classic sound of the acoustic guitar while seamlessly taking the listener into his impressionistic compositional world of alternative tunings, phrasings, and tonality." - Joel Krutt; host of "Pushing the Envelope," WHUS-FM. Radio WMBR-FM in Boston is featuring the track "Modus Novus II" from the new album The Book of Crossings. Radio WMBR-FM in Boston is featuring the tracks "Neither Nor Here," and "Though Unclosed, Speaking" from the new album In Winter. I currently have two albums charting in the Top 100 World/New Age category: Dreaming As I Knew and In Winter. Big thanks to both Michael and Carl. A new review from Lux Atena magazine in Spain for Dreaming As I Knew. New review from Progression magazine for I walked into the silver darkness. Greydisc Records announces the new album by Kevin Kastning and Sandor Szabo, entitled The Book of Crossings. Worldwide release date August 7, 2012. Afterglow on WMUH-FM has placed Dreaming As I Knew at no. 2 in its Top 10 for June 2012. New reviews for In Winter, including one from Lux Atena magazine in Spain. Dreaming As I Knew is being featured on NPR radio KUNM in New Mexico. In Winter is listed as one of the top-selling new age albums at CDBaby. A new interview at MWE3 magazine. Afterglow on WMUH-FM has placed Dreaming As I Knew in its Top 10 for April and May 2012. New review for In Winter from Music Web Express magazine. Dreaming As I Knew places at no. 51 in the Top 100 new age/world albums for May 2012. Mark your calendars! Mark Wingfield and Kevin Kastning: Live in New York City! Album release party and concert at Drom in NYC, Monday November 5. 2012. On Retelling from In Winter is being featured on NPR station KLCC-FM in Oregon. The Reviews page for Triptych has been updated. Voices in Light from Dreaming As I Knew is being featured on WMUH-FM in Pennsylvania. Dreaming As I Knew is no. 76 on the New Age/Ambient Top 100 chart. The WFMU-FM in New York City live radio performance of Carl Clements and Kevin Kastning of April 30, 2012 is now available at the Free Music Archive. Greydisc Records announces the release of the new album by Michael Manring and Kevin Kastning entitled In Winter. Release date is May 29, 2012. Available now for pre-order at amazon.com. WRUV-FM in Vermont is featuring various tracks from "Dreaming As I Knew" throughout May. Radio airplay this week for "Dreaming As I Knew"
If you missed the live radio performance of Carl Clements and I yesterday on WFMU-FM in New York City, you can listen and see performance photos of us in the WFMU studios here. Carl Clements and I will be doing a live radio performance on WFMU-FM in New York City on Monday, April 30 from noon - 3 PM EST. You can listen live online at WFMU.org. From the WFMU website: "Monday April 30th: Kevin Kastning - For a number of years Kevin Kastning has been turning acoustic guitar playing inside out. Sonic landscapes populate his music, with microtonal overlays of tones and textures. The Massachusetts-based Kastning also favors collaborations that mesh into musical other-ness, such as his discs with Hungarian guitarist Sándor Szabó and one with U.K guitarist Mark Wingfield last year. His lateest, "Tryptich" features a trio with Szabó and Balázs Major, and there's another new one on the way. Kevin Kastning plays live." New review for Dreaming As I Knew from FAME Magazine. New review for Dreaming As I Knew from Guitar Player Magazine. KDNK-FM in Colorado has been featuring Dreaming as I Knew. WFMU-FM in New York City has been featuring the tracks "A Different Breath, About Nothing," and "Nothing Here But Dreams" from the new album Dreaming as I Knew. Today, Dreaming As I Knew reached No. 1 on amazon.com's list of Top 100 Avant-Garde Jazz/Free Jazz albums. In March and April, WFMU-FM in New York City has been featuring the tracks Troglodyte hiemalis, Harangok, and Quatrefoil from the album Triptych. 2012 Triptych Tour: I will be on tour in Europe with Sándor Szabó and Bálazs Major March 20 - 28. Greydisc Records announces the release date for the new album by Kevin Kastning and Carl Clements entitled "Dreaming As I Knew." Release date: March 27, 2012. Long quiet transform of a thousand skies from I walked into the silver darkness is being featured on WFMU-FM in New York City. Triptych is being featured on "The New Edge" show on NPR station WMBR-FM. A nice mention in the Berklee Alumni Magazine. Triptych is being featured in the Czech Republic on Czech Radio 3. The tracks Utazás and Triptych II from the new album Triptych on Amazon's Hot New Releases in Avant Garde list. Introducing the new 14-string Kevin Kastning Contraguitar model C2 from Daniel Roberts Stringworks. WDBX-FM in Illinois is featuring the tracks Triptych I, Triptych II and Triptych III from the new album Triptych. WFMU-FM in New York City has named Arch of unimagined bridges from I walked into the silver darkness as one of their favorite tracks of 2011. Triptych is being featured on NPR's Vermont Public Radio WRUV-FM. Radio KZUM-FM in Lincoln, NE is featuring the track Utazás from the album Triptych. European concert tour in March 2012 with the trio on my new album Triptych. Concert tickets for dates in Hungary are on sale now: March 22: Vac, Hungary. New York City: double airplay for both Triptych and I walked into the silver darkness today on WFMU-FM in New York City. Featured tracks were Triptych II from Triptych and The mirror of here from I walked into the silver darkness. Updates on the Triptych reviews page. Airplay for Triptych on NPR's Vermont Public Radio WRUV-FM. Updates on the Strings and Tunings page. The arch of unimagined bridges from I walked into the silver darkness is being featured on WFMU-FM in New York City. Triptych, released today by Greydisc Records. A new interview with Mark Wingfield and myself from Music Web Express 3000 magazine. December airplay for I walked into the silver darkness on WFMU-FM in New York City, WTUL-FM in New Orleans, Radio BFJ; Tokyo, Japan, and WWUH-FM in Connecticut/Central Massachusetts. Greydisc Records announces the release date for my new album Triptych. This album was recorded on-location in Europe, and features guitarist Sandor Szabo and percussionist Balázs Major. US release date for Triptych is December 13, 2011. I have just completed recording sessions with British guitarist Mark Wingfield for our third album. The album will be released on Greydisc Records in 2012. November airplay for I walked into the silver darkness on WFMU-FM in New York City, WTUL-FM in New Orleans, Radio BFJ; Tokyo, Japan, and WWUH-FM in Connecticut/Central Massachusetts. I have completed recording sessions for a new album with bass virtuoso Michael Manring. The album will be released on Greydisc Records in early 2012. I have completed recording sessions for a new album with Belgian lutenist Gilbert Isbin. The album will be released on Greydisc Records in 2012. I walked into the silver darkness continues to be featured on WTUL-FM in New Orleans. New reviews for I walked into the silver darkness. I walked into the silver darkness is being featured on-air at Radio BFJ; Tokyo, Japan. 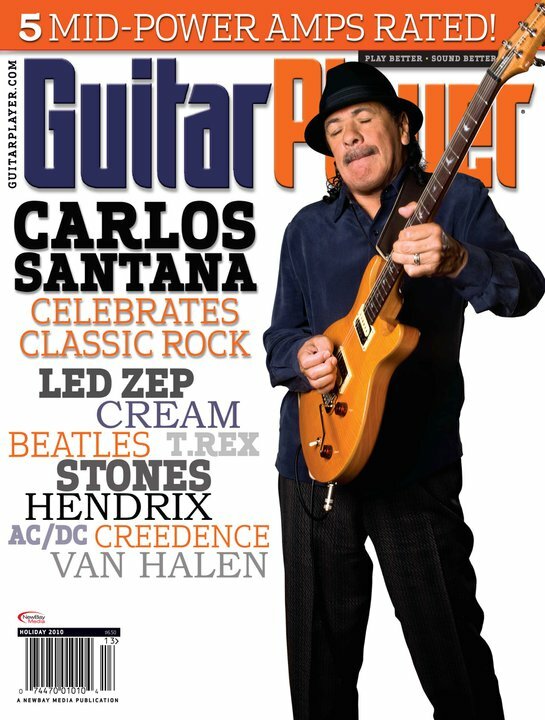 The September 2011 Guitar Player Magazine article is now available online. Gravity of Shadows continues to be featured on WFMU-FM in New York City. I walked into the silver darkness is being featured on NPR station KZUM-FM in Lincoln, Nebraska. New additions to the Interviews page. I walked into the silver darkness is being featured on WTUL-FM in New Orleans. I walked into the silver darkness continues to be featured on WFMU-FM in New York City. I walked into the silver darkness continues to receive airplay on NPR's Vermont Public Radio WRUV-FM. NPR stations WDBX and WSIU in Chicago are again featuring the track Air distance transform from I walked into the silver darkness. I walked into the silver darkness is being featured on WFMU in New York City. I am now an Artist Endorser for Anvil Cases. Mark Wingfield and I are featured in the print version of the September 2011 issue of Guitar Player magazine, in an article about the making of I walked into the silver darkness. Gravity of Shadows is again being featured on-air at NPR's WRUV-FM in Vermont. More radio support for I walked into the silver darkness from NPR stations WDBX and WSIU in Chicago. Featured tracks are Air distance transform, From all the green around you, and The sharp crucible of autumn. WDBX radio in Chicago is featuring the tracks Air distance transform, From all the green around you, and The sharp crucible of autumn from I walked into the silver darkness. Updates at amazon.com's Kevin Kastning store. The New Edge show on WMBR-FM in Cambridge, Massachusetts is featuring the tracks Scattered rain of sleep and What when winter comes from I walked into the silver darkness. An interesting essay at Mark Wingfield's blog. I walked into the silver darkness receives its first US airplay on Vermont Public Radio. What when winter comes is the featured track. I walked into the silver darkness debuts at number 13 on amazon.com's "Hot New Releases in Avant Garde & Free Jazz" list. The New Album page, with clips from the new album by Mark Wingfield and Kevin Kastning, entitled I walked into the silver darkness. Greydisc Records announces the release date of the new album by Mark Wingfield and Kevin Kastning, entitled I walked into the silver darkness. International release will be June 21, 2011. This is the first album release to feature the 14-string Contraguitar. Guitar Player magazine asked me to write an article for them; it is now available online. Umbra I - IV from Gravity of Shadows is being featured on-air at NPR's WDBX-FM in Chicago. Gravity of Shadows is being featured on-air at NPR's WRUV-FM in Vermont. A new review for Gravity of Shadows from FAME Magazine. Cartesian Other from Parabola is being featured on radio LoRa 97.5 FM in Zurich, Switzerland. Part 2 of my interview with The Perfect Sound Forever magazine. Part 1 from December 2010 is here. A new review for Returning from Jazz Weekly. I have just completed recording sessions for an upcoming duo album with guitar great Alex De Grassi. More info coming soon. I will be at the opening show and reception for artist Ken Browne's new exhibit of paintings based on my music. It will be at the Origin Gallery, located at 83 Harcourt Street in Dublin, Ireland. Date: 6 - 8 PM, Thursday March 24, 2011. Gravity of Shadows is number seven on Amazon.com's list of Best 20/21st Century Classical for 2011. NPR's "Pushing the Envelope" on WHUS-FM is featuring First Shadow Rising from Gravity of Shadows. Gravity of Shadows is now available in Japan. The complete transcript from the Holiday 2010 Guitar Player magazine interview. Gravity of Shadows, the new album from KastningSiegfried, has been released by Greydisc Records, and is now available at Amazon.com. Leaf Dawn Resist from Returning featured on NPR station KTRU-FM. The Village Voice Critics Poll: Top 800 Albums for 2010: Returning places at #374. Greydisc Records announces the new album from KastningSiegfried, entitled Gravity of Shadows. Release date: 25 January 2011. New interviews on the Interviews page. Part 1 of a new interview published at The Perfect Sound Forever. My interview with Guitar Player Magazine: online edition with extras. I have just completed the recording of two new albums with British guitarist and composer Mark Wingfield. The first of these will be released mid-2011; details coming soon. Returning is again being featured on-air at NPR's WRUV-FM in Vermont. Here is the cover of the Holiday 2010 issue of Guitar Player magazine in which I will be featured. A new review for Returning from Sea of Tranquilty. Returning continues to be featured on WFMU in New York City. Announcing the Kevin Kastning Contraguitar from Daniel Roberts Stringworks. The Instruments page has been updated. Version 2 of the Bricasti M7 digital reverb contains a preset named "Studio K." This is a recreation of the acoustics and overall sound of the live room at Studio Traumwald. Amazon.com now has a Kevin Kastning store. Returning is being featured on WFMU in New York City. Returning is being featured on the Canadian Broadcasting Corporation (CBC) show "The Signal." I will be the subject of a feature article in the December 2010 issue of Guitar Player Magazine. This from the Guitar Player twitter: "BC: I just completed a fascinating interview with Kevin Kastning, one of the deepest guitarists I've ever encountered." I will be recording an album with England's Mark Wingfield in the coming months. Mark plays only electric guitar, and I play only acoustic, so this promises to be a most unusual project. Stay tuned. New review for Parabola from Exposé Magazine. More radio airplay for Returning by NPR on Washington D.C.'s WPFW-FM. Returning featured on Hearts of Space. Radio airplay for Returning on Wisconsin's WWSP-FM. New reviews posted for Returning. Radio airplay for Returning by NPR on Washington D.C.'s WPFW-FM on the "G-Strings" show. Radio support for Returning on WCJZ-FM. The big interview from Billy's Bunker magazine. "The New Edge" show on WMBR-FM 88.1 in Cambridge, Massachusetts is featuring Point of Entry from Returning. WHUS-FM in Connecticut is featuring Sempiternal from Returning. "The New Edge" show on WMBR-FM 88.1 in Cambridge, Massachusetts is featuring Over the hills, the clouds seem so distant from Returning. I am now being represented by Two For the Show Media in New York. Returning is being featured on-air, as well as reviewed at NPR's WRUV-FM in Vermont. Returning is now available in Japan. Returning is now available in Germany. The piece Leaf Dawn Resist from the new album Returning was featured on Australia's Sideways Through Sound radio show on FM 107.3. Listen to the show here. Returning will be featured on Australia's Sideways Through Sound show this week. You can listen live at 107.3FM (in Sydney), or stream at: www.2ser.com/stream, at 9PM (21:00) hours, Sydney, Australia time. It will also be broadcast the following Sunday for non-Australian listeners at a more reasonable time; please see the website for details. The show will also be available as a free download after broadcast only from the Sideways Through Sound website. New review published for Scalar Fields. New review published for Returning. Large gratitude to bass visionary Joe Zon of Zon Guitars. Joe is supplying master luthier Daniel Roberts with custom fingerboards for the upcoming KK-Contra 16-string guitar; as well as Phase II of the DKK-12 Extended 12-string Baritone. Thank you, Zon! Vermont NPR station WRUV-FM has been featuring the track "Sialia sialis" from "Returning." Greydisc Records announces the release of the new album by Sándor Szabó and Kevin Kastning, entitled "Returning." "Returning" receives its first radio airplay on Illinois NPR station WDBX 91.1 FM. WDBX is featuring the tracks "Point of Entry," and "Returning to a Place We’ve Never Been." Greydisc Records announces the release date of the new album by Sándor Szabó and Kevin Kastning, entitled "Returning." The album will be released on June 1, 2010. Carl Clements / Kevin Kastning Duo: Live in New York City, Friday, May 7, 2010. If you're in the New York City area, I will be appearing with Carl Clements for the opening of a retrospective art show by the internationally-known artist Amanda Barrow. Time is 6 - 8 PM; location is the Blackburn 20/20 Gallery | Elizabeth Foundation | 323 W. 39th St., NYC.  WKCR-FM in New York City has been featuring Vertex II and Vertex III on their Transfigured Night show.  If you're in Japan, Parabola is now available at amazon.com's Japan site. Another review from the 2009 European Tour. NPR's "Pushing the Envelope" program names Parabola as one the best albums of 2009. New review of Parabola from Spain's Lux Ateneal webmagazine. Greydisc Records announces the June 2010 release of the new album by Sándor Szabó and Kevin Kastning, entitled "Returning." New review added for Parabola. I was invited to participate in the 2010 Palazzo del Majno International Opera Competition in Italy. New concert reviews page added. Parabola again featured on the Canadian Broadcasting Corporation (CBC) Radio 2 show "The Signal." More Parabola sales in Japan. Thank you, Japan! Visitors to my website have now topped 95,000 per month. My sincerest gratitude to those who have visited. New review of the Budapest concert. Interview in the Nashoba Valley Newspapers. New photos from the 2009 European Tour. From Europe's Gondola Magazine comes a new review of Parabola. Translation of one of the Budapest concert reviews. A review of the concert in Vacz, Hungary. From Europe's Gondola Magazine comes a new review of Resonance. From Europe's Elkultura Magazine comes a new review of Parallel Crossings. Parabola has been receiving support and airplay from the Canadian Broadcasting Corporation (CBC) Radio 2 on their show "The Signal." NPR station KUNM-FM radio in Santa Fe, New Mexico is featuring Vertex IV from Parabola. On Tour page updated with photos from the 2009 tour with Dominic Miller and Sándor Szabó. The 2009 European Tour was wonderful. Here is a review; more photos and info coming soon!  Radio airplay in Budapest on Pelikán Rádió FM 93.6.  On Tour page updated. NPR's WRUV-FM, Vermont is featuring more tracks from Parabola. Click here to listen to the WRUV interview. Or go here. New tour information at Hungary's Gitarhangtechnika. I will be the on-air guest for an interview and feature involving my music on NPR's WRUV-FM for Vermont Public Radio. Broadcast time/date is Tuesday August 25, 3 - 6 PM on "The Floating Head Of Zsa Zsa" show. NPR station KUNM-FM in Santa Fe, New Mexico is featuring Reflective Asymmetry from Parabola. New page added for the tour. More Parabola radio airplay on WRUV-FM, Vermont. Sandor and I will be appearing in concert at the Millenaris Theater in Budapest, Hungary on September 27, 2009. Parabola featured on CKDU 88.1 FM, Nova Scotia, Canada. NPR's Indiana Public Radio WFIU FM featuring Vertex I from Parabola on their Artworks page. The webmagazine Guitartechnika in Hungary presents this 12-string article. Here is a rough English translation. Parabola radio airplay on "Difficult Listening," on RTRfm radio; Perth, Australia. Parabola radio airplay on WRUV-FM, Vermont. Parabola radio airplay in Hungary on the Rhythmic Wheel program. Parabola radio airplay in Chicago on the ITDE show at WDBX-FM. New interview from Italy's classical label OnClassical. Another mention from Acoustic Guitar magazine in this article. 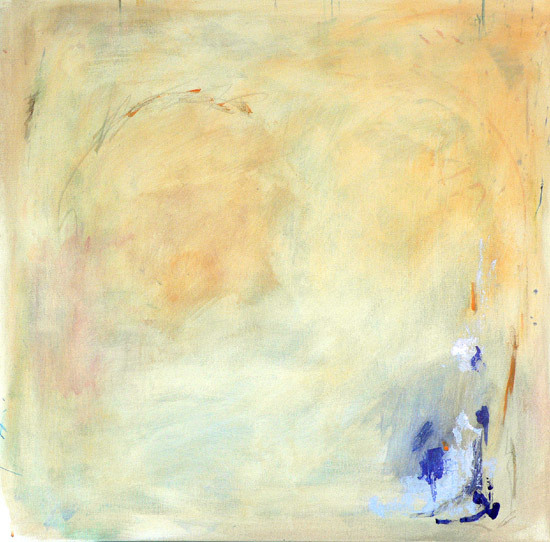 New painting from American artist Jacquie Gouveia based on and inspired by Parabola. I am proud to announce that I am now an Artist Endorser for Peluso Microphones. Australia: The show "Sideways Through Sound" on 107.3 FM in Sydney, Australia continues to feature tracks from Parabola. Sales of Resonance and Parabola in Japan. Thank you, Japan! I am proud to announce that I am now an Artist Endorser for Kelstone. Parabola added to WRUV Reviews page. Parabola featured on the Hotlist at Eckhart Tolle's website. Artist Endorsements page added. These are companies with whom I am honored to be associated. I am proud to announce that I am now an Artist Endorser for Ireland's Enhanced Audio. The Szabó-Kastning 2009 European Tour kicks off September 25 in Budapest. More info coming soon! Alooga Radio in Germany is now featuring the tracks "Hyperbola," "Trilateration," and others from my latest album, Parabola on their "Starlight" show. Parabola is featured on WFMU's Artworks page. Radio WFMU New York City has added "Vertex I" and "Vertex II " from Parabola to their playlists.  Australia: The show "Sideways Through Sound" on 107.3 FM in Sydney, Australia is featuring tracks from Parabola.  Australia: Radio 2SER Sydney requested a station ID from me; you can listen to it here.  Italy: I have signed with the Italian online label OnClassical. More information here.  And a mention in this blog article from Italy. Australia: The show "Difficult Listening" on Australia's RTRfm radio network has added "Hyperbola" from Parabola to their playlists. Greydisc Records announces the official release of the new album by Sándor Szabó and Kevin Kastning entitled, "Parabola." Based on some inquiries, I have added a new Donate page. • New reviews published for Parallel Crossings. New page added for the latest instrument in the Santa Cruz KK series, the KK-Alto guitar. • Strings and Tunings page updated. Greydisc Records announces the upcoming release of the new album by Sándor Szabó and Kevin Kastning entitled, "Parabola." The album will feature 11 new compositions, and is slated for worldwide release on February 24, 2009. Exposé Magazine reviews both Resonance and Parallel Crossings. NPR station WRUV-FM in Burlington, Vermont has added "Parallel Crossings" to their "In the Moment" expanded listening program. I am featured in the new Sweetwater catalog on pg. 245 in the Bricasti ad. The M7 is truly my favorite studio reverb ever, and I am proud to be an artist endorser for Bricasti. The new album "Unplugged and Unfretted," a compilation featuring fretless acoustic guitarists from around the world, has been released. Included on the album is my own performance of my composition, "Towards the door we never opened." It is an honor to be among the fine artists represented on this album. albums Scalar Fields and Bichromial are now available in Japan, and sales have been reported. Thank you, Japan! I have been added to England's "Unfretted" fretless guitar resource website for my fretless work on "Scalar Fields." The University of Vermont's WRUV-FM in Burlington, Vermont has added "Open Form No. 3" from "Bichromial" to their "In the Moment" expanded listening program. New additions to the Instruments page. I have been working with Santa Cruz on two new instruments, shown in the "Santa Cruz Customs" section on the Instruments page. The Reviews page has been updated. The Quotes page has been updated. The mp3 Download page has been updated. The Overworld page in the Images series has been updated with 26 new photos. 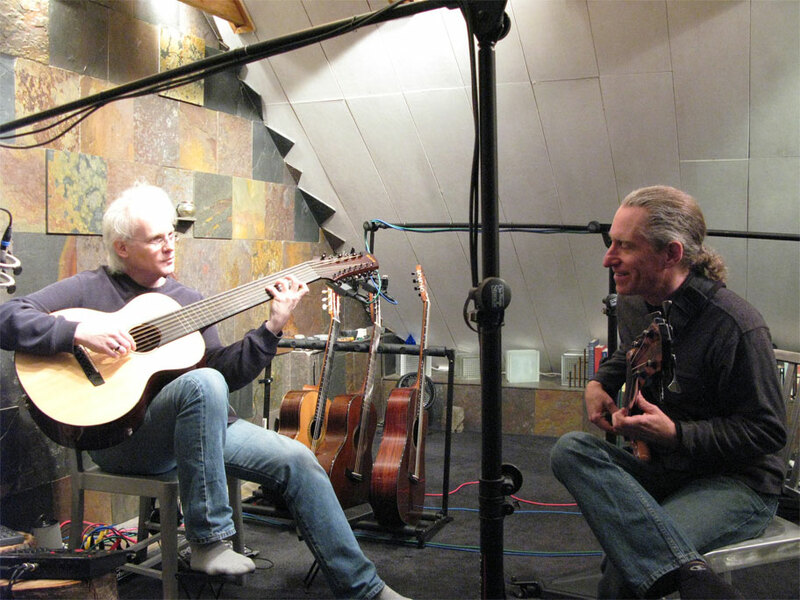 I will be recording a duo album with the great Hungarian multi-guitarist, Sándor Szabó. Recording sessions in Hungary have already begun, and US recording sessions will begin in December. I am honored to be collaborating with Sándor; he is a true artist and a virtuosic force in expanding the voice and range of the acoustic guitar, with such innovative instruments as 16-string acoustic guitars; both steel-string and nylon-string versions. Sándor is also a master of the baritone guitar and fretless acoustic guitar. I recommend his music very highly. Release dates and other information will be posted here as those details become available. Worldwide release is scheduled for mid-2007. The MySpace page is now up and running. The KastningSiegfried album "Scalar Fields" will be featured in September and the following months on UK's The Acoustic Stage - radio for new music. The Images page has been completely re-built, with all photos categorized into six different pages. In the process, over 110 new photos were added. The KastningSiegfried page has been updated. Radio Brazil has contacted me inquiring about a feature spot and interview for their radio network. Details will be posted here as they become available. I am now an artist endorser for G7th Performance Capos. My use of capos is unorthodox; I will use them around the 10th fret when recording, to achieve a pseudo-harpsichord effect. Since I usually employ this effect on 12-string, it's been impossible to find a capo which works correctly. The G7th 12-string capo has been working well for this purpose, and I'm proud to be onboard with them. I have been collaborating with Laurent Brondel, and will appear as a guest on his next album. Release date and CD details will be posted here as they become available. The Contact Me page now features an instant messaging widget. If you see me online, feel free to say hello. For 2006, my website has been logging an average in excess of 45,000 visits per month. Thank you all for stopping by! The new Santa Cruz DKK-12 Extended Baritone 12-string guitar is announced. A new page contains photos, the DKK-12 story, and an article by Dan Roberts of Santa Cruz Guitars. In response to inquiries, I've added a new String Gauges and tunings page. As of this week, amazon.com has sold out of Scalar Fields four times since January 2006. Copies are in stock now! I have been working with Santa Cruz Guitars on designing and developing another experimental instrument in the DKK series. Details here when the new model is complete. The Digital Download page has been updated. KastningSiegfried albums are now available in nine countries and counting. New Quotes page has been added. New review from Guitar Player Magazine on the reviews page for Scalar Fields. "Pushing the Envelope" on WHUS 91.7 FM radio in Connecticut will be featuring "Macrolibrium 8" and "Macrolibrium 9" from the KastningSiegfried album Scalar Fields. KastningSiegfried have been collaborating with Carl Clements, recording compositions for his next album. Release details will be posted here as they become available. The reviews page for Scalar Fields has been updated. New page added for Digital Distribution. My albums may be purchased for download by the track or by the entire album. Reviews page and Images page have been updated. WDBX 91.1 FM radio in Chicago will be featuring "Microlibrium 2" and "Microlibrium 3" from the new KastningSiegfried CD Scalar Fields in November 2005 on the experimental music show "ITDE." Scalar Fields, the new CD from KastningSiegfried: excerpts, background information, purchasing links, and more. In collaboration with the Santa Cruz Guitar Co., the new Kevin Kastning extended baritone guitar, the Santa Cruz DKK has been announced. I will be the guest on the November 17, 2005 broadcast of the TV talk show, "Around Town Live," on northern Massachusetts cable TV. A new CD by KastningSiegfried will be released by Greydisc Records on November 1, 2005. The album consists of 20 new compositions and is entitled, "Scalar Fields." The instruments I'll be playing on Scalar Fields are: 6-string acoustic, 12-string acoustic, fretless classical, and the new Santa Cruz DKK Extended Baritone guitar. Available through Amazon.com, CDbaby.com, Borders.com, cdnow.com, Target.com, virginmega.com, and Waldenbooks.com, as well as this website. Samples in mp3 format will be posted here a few weeks prior to the release date. As an artist endorser for John Pearse Strings, I've collaborated with them on introducing a new baritone string based on my specifications. I'm using it as the low G on the new baritone; it is an .080 double-wound phosphor bronze, and is now available from John Pearse Strings. The London Chamber Group will again be performing Quartet Semiotic No. 1 for Flute, Violin, Clarinet, and Cello in London, England on their October 9, 2005 concert. I am now a BMI-affiliated composer. Reviews page updated; new quotes and a feature magazine article/cover. Broadcasts page and Reviews page updated. The London Chamber Group's world premiere of Quartet Semiotic No. 1 for Flute, Violin, Clarinet, and Cello, took place in London, England on May 22, 2005. Instruments page and Links page updated. NPR Radio WFIU 95.1 FM at the University of Indiana will be featuring three tracks, Open Form Nos. 1 - 3, from the new KastningSiegfried CD Bichromial in March 2005 on the show "Late Night Music." The KastningSiegfried composition Open Form No. 16 from the album Bichromial has been released on the Oasis New Age Vol. 5 collection CD. String Quartet No. 5 has been added to the Modern Classical page, complete with mp3 excerpts, a score example, and program notes. KastningSiegfried are back in the recording studio, at work on their next CD. The new album will be released on Greydisc Records in fall 2005. Details and updates will be posted here. Quartet Semiotic No. 1, the new composition for the London Chamber Group's 2005 concert season is complete. The piece is composed for flute, clarinet, violin, and cello. An excerpt can be heard here. Performance dates will be posted here when available. The KastningSiegfried composition Open Form No. 12 from the album Bichromial has been released on the Oasis Acoustic Collection CD. New photos added to the Images page. WDBX 91.1 FM radio in southern Illinois will be featuring Open Form No. 4 from the new KastningSiegfried CD Bichromial in December 2004 on the experimental music show "ITDE." Bichromial has been reviewed by New Music Box magazine, and selected as a Pick of the Week. New reviews added to the Reviews page. "Pushing the Envelope" on WHUS 91.7 FM radio at the University of Connecticut will be featuring Open Form No. 14 and Open Form No. 15 from the new KastningSiegfried CD Bichromial in November 2004. WDBX 91.1 FM radio in southern Illinois will be featuring Open Form No. 8 from the new KastningSiegfried CD Bichromial in November 2004 on the experimental music show "ITDE." Bichromial has been reviewed by The Netherlands's Bridge Guitar Review magazine. Australia Public Radio will be featuring Open Form No. 15 from the new KastningSiegfried CD Bichromial throughout November 2004 on the show Difficult Listening. Difficult Listening is also broadcast over the internet; the show times are: 1.00pm Sunday GMT, 9.00am US Eastern time, and 6.00am US Pacific time. Bichromial has been reviewed by UK's Music News magazine. Bichromial has been reviewed by Minor 7th web magazine. I have received a request from the London Chamber Group for a new composition for their 2005 concert season. When completed, excerpts from the new composition will be available here. Bichromial has been added to amazon.com's Amazon Early Adopter Indie list, a ranking of the 100 top-selling independent CD releases. I have been selected as 13th Fret Artist of the Month for October 2004. New content added to the Links page. Bichromial, the new CD from KastningSiegfried: excerpts, background information, purchasing links, and more. I have been signed as an Artist Endorser for John Pearse strings. I've been using John Pearse strings for over 20 years, so this is a welcome and exciting development. I will be the guest on the cable TV talk show, "Around Town," on Thursday, October 7. Excerpts from the new CD will be played and discussed on the show. The new CD entitled "Bichromial" by KastningSiegfried is slated to be released by Greydisc Records on September 28, 2004. The CD will be available through Amazon.com, Borders.com, cdnow.com, Target.com, virginmega.com, and Waldenbooks.com, as well as this website. Samples in mp3 format will be posted here a few weeks prior to the release date. Greydisc Records will be releasing a new KastningSiegfried CD in late summer 2004. Details will be posted here. The program notes for the London world premiere of Arborescence for Open Quartet. The London Chamber Group will be performing my composition Arborescence for Open Quartet in a concert which will take place on July 11, 2004 in London, England. An excerpt can be heard here. Quote from Heinrich Schenker: "I would like to stress in particular the biological factor in the life of tones. We should get used to the idea that tones have lives of their own, more independent of the artist's pen in their vitality than one would dare believe." - Schenker: Harmony, p. xxv. An mp3 excerpt for Bilateral Asymmetries No. 1; a new composition for oboe, bassoon, piano, can be heard here. I have been invited to submit a composition for Masterprize 2005. The composition will be scored for full orchestra; excerpts will be posted here when this new piece is completed. 1st voice: violin, flute, clarinet in Bb, or oboe. 2nd voice: violin, clarinet in Bb, or oboe. 3rd voice: viola, clarinet in Bb, or horn in F.
4th voice: cello, bass clarinet in Bb, or bassoon. This presented manifold compositional challenges. E.g., no multiple-stops, which are a standard element of string quartet writing. Ranges had to be kept fairly constant so as to translate well to each instrument. The mp3 excerpt is played by string quartet. 25 new photos added to the Images page. New links added to the Links page. On this date in 1770, Ludwig von Beethoven was born in Bonn, Germany. "Music can name the unnameable and communicate the unknowable." - Beethoven, 1810. BBC Radio 3 in London and Glasgow, and ABC Radio Australia have requested KastningSiegfried CDs for broadcasting. The CDs have gone out, and broadcast dates and times will be posted here. The London Chamber Group have added a page to their website for the compositions of mine with which they're involved. KastningSiegfried are returning to the studio; recording dates for late 2003 and early 2004 have been scheduled. A new CD will be released, and excerpts will be posted here. The KastningSiegfried composition August 5 from the Book of Days CD was featured in the August 20, 2003 broadcast on ABC Radio Australia's "New Music Australia" radio program. New score examples added to the Scores page. New mp3 excerpts of the third movement of String Quartet No. 3, String Quartet No. 4, and Piano Sonata Nos. 7 and 8 added to the Modern Classical page. I received a request from the London Chamber Group for another of my compositions for their 2004 concert season. Details and an excerpt will be posted here. An article in which I'm mentioned can be found here. The program notes for the London world premiere of Bilateral Asymmetries No. 9. Cover art photos have been added to the CDs page, and release information for the new album has been updated. My composition Bilateral Asymmetries No. 9 for wind quintet will be performed by the London Chamber Group on June 15 in London. New mp3 excerpts added to the KastningSiegfried page. "Pushing the Envelope" on WHUS-FM will be featuring three KastningSiegfried compositions from the Book of Days CD. The pieces "August 5," "August 8," and "March 1" will be receiving airplay throughout April 2003. FM radio and world-wide Internet broadcasts can be heard on Sundays at 2:00 PM US Eastern Standard Time; London: Sunday, 7:00 - 9:00 PM; Tel Aviv: Sunday 9:00 - 11:00 PM; Hong Kong: Monday 2:00 - 4:00 AM; Sydney: Monday 4:00 - 6:00 AM. I received a request from BBC Radio 3 in London for a Kastning CD for broadcast. Broadcast dates and times will be posted here. I've been added to the Artists section of Guitarra Magazine online. I received a request to submit a composition to be performed at the VII International Guitar Congress Festival in Corfu, Greece; August 2003. Difficult Listening, a radio show for new and experimental music on Australian Public Radio, is featuring a track by KastningSiegfried in January, 2003. "Pushing the Envelope" on WHUS-FM will be featuring the KastningSiegfried composition Binary Form No. 1 throughout January 2003. FM radio and world-wide Internet broadcasts Sunday nights at 10:00 PM Eastern Standard Time; London: Monday, 3 - 5AM; Tel Aviv: Monday 5 - 7AM; Hong Kong: Monday 10AM - noon; Sydney: Monday noon - 2PM. "Pushing the Envelope" on WHUS-FM will be featuring my composition Three Organ Pieces throughout December 2002. FM radio and world-wide Internet broadcasts Sunday nights at 10:00 PM Eastern Standard Time; London: Monday, 3 - 5AM; Tel Aviv: Monday 5 - 7AM; Hong Kong: Monday 10AM - noon; Sydney: Monday noon - 2PM. On this date in 1770, Ludwig von Beethoven was born in Bonn, Germany. "Art demands of us that we shall not stand still." - Beethoven, 1825. Australian Public Radio in Perth, Australia will be featuring my music on upcoming episodes of "Difficult Listening." Broadcast dates and times will be posted here. New mp3 excerpt of Bilateral Asymmetries No. 9 for wind quintet. This is the composition for the London Chamber Group's 2003 concert season. WHUS-FM at the University of Connecticut will be featuring my music on upcoming shows of "Pushing the Envelope." The show will feature KastningSiegfried as well as some of my piano sonatas and organ works. Broadcast dates and times will be posted here. I received a request from the London Chamber Group for one of my compositions for inclusion in their 2003 concert season. Performances will occur in London during the summer and fall of 2003. A piece for them is in progress, and I will post samples here when it's completed. New mp3 sample files on the Listen pages. New score excerpts in .pdf format on the Scores page. New photos on the Images page.